I wanted to try preparing sourdough starter for a long time. Bread Baking Day for this month gave me the perfect opportunity to try it out. I read many articles related to sourdough starter in the web. There are many methods of doing it. Atlast I stumbled upon this site. The author had explained it very well, even I could understand it. I went through the article many times to fully understand the procedure. On February 19th I started my sourdough starter(I think I am explaining it as some important historical event). Sourdough starter needs regular attention. Many of them described it as a baby and named it as if for a baby. It needs feeding twice a day. Otherwise the starter will die. It takes 4 days to 7 days for a starter to mature. You have to keep on feeding it. If you forget one day then the starter is gone for ever. 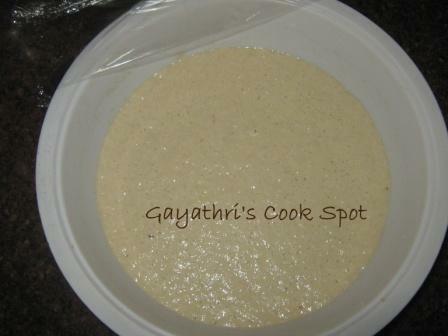 As Madurai is a hot place, my starter was ready in 4 days. But to be sure, I fed it for one more day. Baking a bread with sourdough starter results in tasty bread. In this post I will give the details of preparing and nurturing the starter with some photos. I will be posting the recipes in the coming days. 1. 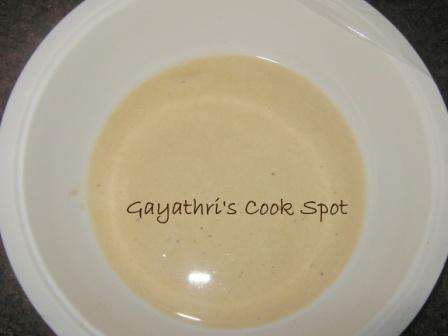 On the first day, mix 1/4cup water and 1/4cup wheat flour in a bowl. Mix it to a smooth paste and cover with cling wrap. Keep it aside for 12 hours. 2. After 12 hours you will see bubbles in the mix. Mix it vigorously with a spoon. 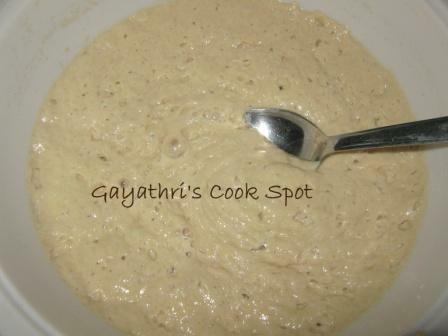 Add 1/4cup water and 1/4cup wheat flour and mix it till smooth. ( If there are no bubbles, just give a rigorous mix and cover with cling wrap and allow it for another 12 hours. If even after 24 hours there are no bubbles then discard it and start new. 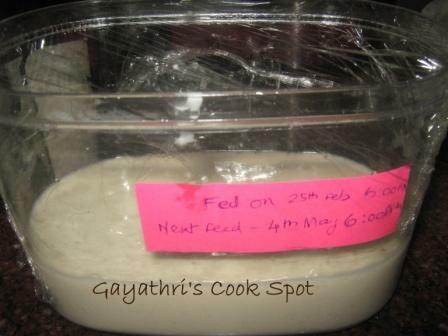 )Adding water and flour is called as feeding the starter. The starting of sour dough starter is with wheat flour. But after 4 feedings, switch to APF. 3. Cover with cling wrap and keep it aside for 12 hours. 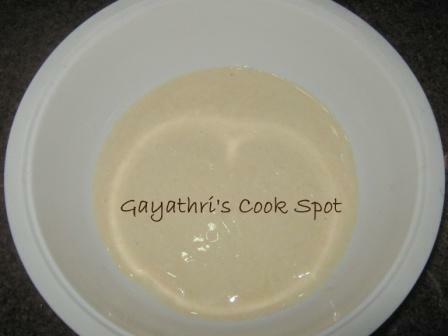 During the second feed, discard half the starter and add water and flour to the remaining mixture. 4. Do not feel sad for discarding the starter, because if you don’t discard then you will fill a swimming pool with the starter in 10 days. 5. So every 12 hours, discard half the starter and feed the remaining. 6. From 5th feed use APF and water. 7. From day 4, your starter will be ready any time. 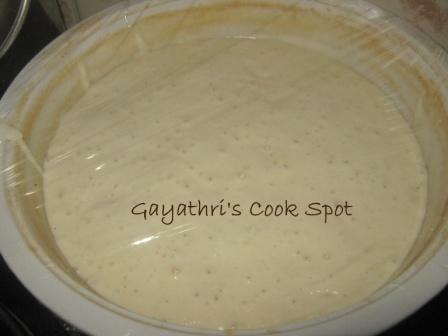 After feeding if the starter dough rises to double within 1-3hours, then your starter is ready. 8. 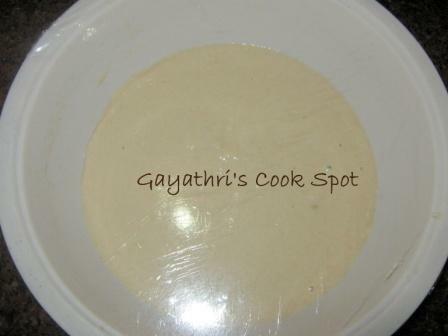 You can use it in any recipe which calls for starter. Use it when it rises to double the size after feeding. 9. If you are goning to use the starter after 1 week, then you can refrigerate the starter after feeding it. Cover the starter in a bowl with wrap. Make some holes for the gas to escape. Refrigerate for 1 week. You have to feed the refrigerated starter after 1 week. ennennamo pannareengka gayathri! I’ve tasted sour dough bread here in paneera breads. Didn’t liked the taste! athukku pinnala ivlo velai irukka??! !